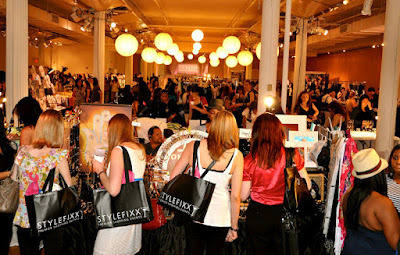 bostonstylista by Sarah McManus: Win Tickets to StyleFixx! I am proud to announce that once again, I have partnered up with StyleFixx! StyleFixx is a fabulous nightlife and shopping event targeting cosmopolitan women ages 21 and up featuring the latest in fashion, beauty and accessories. In addition to great shopping from emerging Boston designers, guests indulge in complimentary cocktails, free spa treatments, and our legendary StyleFixx Swag Bags filled with goodies! The Spring event is scheduled for Wednesday, May 9th and Thursday, May 10th at the Boston Center for the Arts from 5pm-10pm. Meet independent designers and shop their Spring 2012 lines! Score a famous STYLEFIXX Swag Bag Tote® stuffed with goodies! Shop emerging boutiques: Mahi gold, Caryn’s Corner and Cimber Designs! Enjoy complimentary hair treatments by Dellaria Salons! Relax with beauty treatments, and makeovers by Virginn Pure Mineral Makeup! Sample Finale Desserts & Haru Sushi ! I am giving away 7 VIP tickets worth $30 and includes VIP event access, complimentary cocktails, and swag bag totes stuffed with amazing beauty products and samples! TO ENTER: Leave a comment on why you deserve to go to StyleFixx and tweet @bostonstylista @StyleFixxEvents with your answer! As a new Bostonian I'd love to see what Boston has to offer by way of new designers, meet new people, and check out all of the amazing goodies. I love supporting local artists and promoting the Boston fashion scene. stylefixx is such a fun event, I'de love to go and pick out a great mothers day gift for my mom there, they always have such awesome vendors! Being a young woman living in Boston and working in the fashion scene trying to help make a name for Boston it is important that we all support eachother and why not have fun while doing it! ?